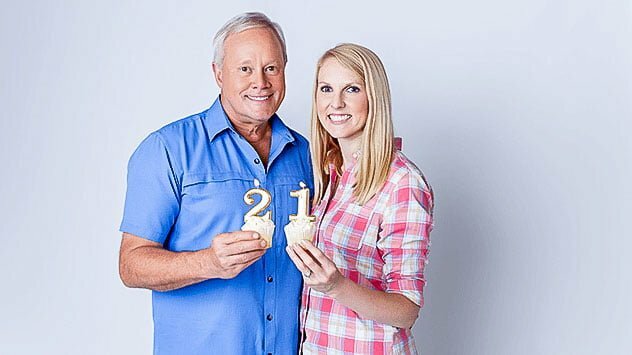 “Today’s Homeowner” hosts Danny Lipford and Chelsea Lipford Wolf celebrate the show’s 21st season with its highest Nielsen ratings ever. MOBILE, ALABAMA (April 15, 2019) – The February 2019 TV ratings released by Nielsen report 2.1 million viewers are tuning in weekly to watch “Today’s Homeowner with Danny Lipford” setting an all-time high audience for the nationally syndicated home improvement TV show. These record-setting numbers represent a 7% increase, or 127,000 new viewers, over the show’s previous quarter ratings from November 2018, and a 32% increase, or nearly 500,000 new viewers, over the same ratings period last year (February 2018). This substantial audience growth for “Today’s Homeowner” Television indicates a continued, steady, upward trend of interest and loyalty for the brand. “Today’s Homeowner” TV is a weekly half-hour home improvement show airing on 214 stations in the U.S., reaching 91 percent of the country. In 2018, the show gained international clearance on the Rural Channel network in Canada, making it available to 1 million additional viewers. Amazon Prime Video is also a partner for “Today’s Homeowner” Television, offering on-demand streaming for past seasons of the show at TodaysHomeowner.com/Amazon. Now in its 21st consecutive broadcast season, namesake and host of the brand, Danny Lipford, reflects on his show’s success. Each week on the show, veteran home improvement contractor and expert, Danny Lipford, and his co-host and daughter, Chelsea Lipford Wolf, tackle repair and improvement projects alongside real homeowners. The father-daughter team takes on DIY-friendly projects, teaching and sharing tried-and-true tips with homeowners, and the audience, along the way. In addition, the show includes regular segments for “Simple Solutions,” which offers clever tips and hints, and “Best New Products,” which highlights innovative tools on the market. Additionally, the media brand hosts the top home enthusiast destination website, TodaysHomeowner.com, drawing more than 2 million monthly visitors, the weekly “Today’s Homeowner” Podcast, robust social media channels and the award-winning lifestyle blog and web series, “Checking In With Chelsea.” 3 Echoes Productions, the professional production arm of the brand, serves an impressive national clientele with expert video services.